It’s hockey season, and there’s nothing we love more than watching our favorite NHL teams hit the ice. Over the years, The Fine Art Studio of Rotblatt-Amrany has been honored to create several permanent bronze monuments commemorating NHL legends from teams across the United States. With the 2014 hockey season upon us, we are taking a look back at the commissions our artists have done to honor the sport and some of its most famous players. How many of these sculptures have you seen in person? Two of the more well-known NHL players to be memorialized in bronze by Rotblatt-Amrany studio artists are the dynamic duo, Bobby Hull and Stan Mikita. Former Blackhawks Captain and Assistant Captain can be seen together, immortalized outside of the United Center in Chicago. 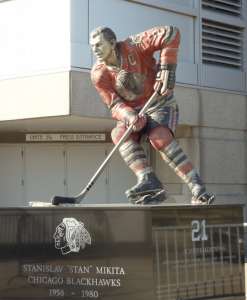 Omri Amrany created the depiction of Bobby Hull, but it was Julie Rotblatt-Amrany who forged the bronze statue of Stan Mikita. The two statues together took 10 months to create and each weighs over 1,500 pounds. 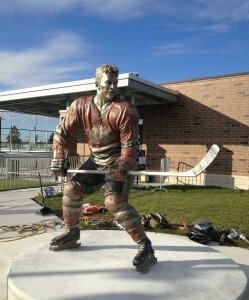 The second bronze monument dedicated to “The Golden Jet”, Bobby Hull sits outside the Bobby Hull Community Ice Rink in Cicero, IL. The rink opened in December 2011, funded in part by Blackhawks team owners. The statue stands as an inspirational reminder to hundreds of visitors to achieve their own greatness. Bobby Hull was a member of the Chicago Blackhawks from 1957 to 1972. The bronze statue at this location was created by Omri Amrany and Oscar Leon. Three other hockey legends were created by the Fine Art Studio of Rotblatt-Amrany. The Detroit Red Wings had three of their players cast into bronze. One is Gordie Howe, also known as “Mr. Hockey”. The other two next to him are Alex Delvecchio and Ted Lindsay. 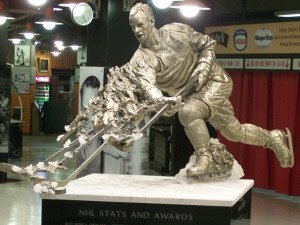 These statues are especially unique since they capture the power and motion of the players as they had appeared on ice. The figures themselves were created with white bronze while the “ice” below them was carved from granite. The statues are over 7 ½ feet tall and are located on the Joe Louis Arena Concourse. Omri Amrany was the lead artist for all three of these famous statues. Last but not least, former Los Angeles Kings player Luc Robitaille, another NHL hockey legend, will soon have his likeness unveiled in bronze this coming March 2015. Stay tuned for photos of the finished work, and more news about its installation on March 7th at the Star Plaza in Los Angeles. Have an idea for a statue of your own? Browse through our variety of works at www.rotblattamrany.com, or call us at (847) 432-9925. Connect with us on Facebook and share your photos posing with these famous NHL Statues!